The British army has been using various sexual intimidation techniques to interrogate Iraqi prisoners and today some of them are demanding a public inquiry, taking a collective case to the High Court of Great Britain. ­Human rights lawyer Phil Shiner, the head of Public Interest Lawyers, says that from March 2003 to December 2008, his 142 clients went through a whole range of insults and threats and that these aspects of the British interrogation policy has never been fully explored. 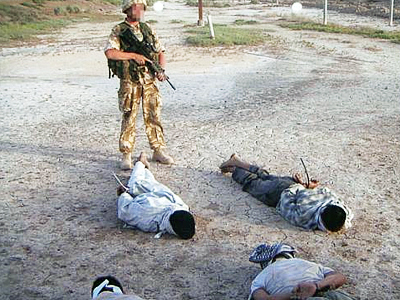 “It is clear that the interrogation policy included a directive to always strip the Iraqi internees, force nakedness and keep them naked if they would not co-operate,” the lawyer asserted.This nakedness was often taking place in front of group of British soldiers, including women; those who refused to strip were forced to do so. “One of the interrogators gave evidence on April 26 this year, saying that the only limits to coercion were the stretches of one’s imagination,” Phil Shiner said. The lawyer does not doubt the trustworthiness of the collected evidence, which consists of the signed witness statements of his clients.“Not one of our clients has been found – by any court or inquiry – to be embellishing the truth, let alone lying, and there is absolutely no reason why they would make this up, because it is a matter of gross humiliation for a Muslim to be subjected to these matters, and I myself have no doubt that what they are saying is a truth,” he affirmed. The lawyer believes the interrogation practices filed to court are systemic policy and that this interrogation policy is “blatantly unlawful’ and must be exposed.